within a comparatively few years, a new branch of astronomy has arisen which studies the sun, moon, and stars for what they are in themselves and in relation to ourselves. In 1835, Auguste Comte, a prominent French philosopher, stated that humans would never be able to understand the chemical composition of stars. He was soon proved wrong. In the latter half of the 19th century, astronomers began to embrace two new techniquesspectroscopy and photography. Together they helped bring about a revolution in people's understanding of the cosmos. For the first time, scientists could investigate what the universe was made of. This was a major turning point in the development of cosmology, as astronomers were able to record and document not only where the stars were but what they were as well. Astronomical spectroscopy was an off-shoot of chemists' attempts to analyze materials on Earth as well as scientists' interest in the nature of color. There were some early forays into spectroscopy before 1850. Joseph Fraunhofer, for example, mounted a prism in front of the objective lens of a small telescope, making a crude spectroscope. He found that when light from the sun and bright stars like Sirius was analyzed there were characteristic absorption lines present in the spectrum produced. Fraunhofer, however, died before he could study this phenomenon more fully. that are the signatures of known chemical elements. The curve above shows overall brightness. Who Was Annie Jump Cannon? 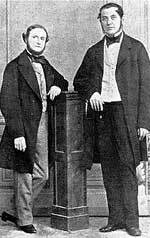 A major advance was made in 1859 by Gustav Kirchhoff and Robert Bunsen (whose name should be familiar to every chemistry student). Bunsen's development of a powerful gas burner was essential for the research they did in Heidelberg, Germany. In 1859, Bunsen reported to a colleague that Kirchhoff had made "a totally unexpected discovery." He had identified the cause of the dark lines seen in the solar spectra by Fraunhofer and others. When certain chemicals were heated in Bunsen's burner, characteristic bright lines appeared. In some cases these were at exactly the same points in the spectrum as Fraunhofer's dark lines. The bright lines were light coming from a hot gas, whereas the dark lines showed absorption of light in the cooler gas above the Sun's surface. The two scientists found that every chemical element produces a unique spectrum. This provides a sort of "fingerprint" which can confirm the presence of that chemical. Kirchhoff and Bunsen recognized that this could be a powerful tool for "the determination of the chemical composition of the Sun and the fixed stars." Throughout the 1860s, Kirchoff managed to identify some 16 different chemical elements among the hundreds of lines he recorded in the sun's spectrum. From those data, Kirchoff speculated on the sun's chemical composition as well as its structure. If we were to go to the sun, and to bring some portions of it and analyze them in our laboratories, we could not examine them more accurately than we can by this new mode of spectrum analysis. Early astronomical spectroscopy concentrated on the sun because of its brightness and its obvious importance to life on earth. In time, astronomers began to turn their attention to the myriad other stars available for study. Scientists like William Huggins and Angelo Secchi gathered as many spectra as possible and, like many scientists working in the nineteenth century, spent a considerable amount of time placing them into (and arguing the merits of) classification schemes. Three basic groups emerged: blue and white stars, yellow (or solar-type stars), and red stars. 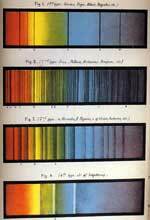 In 1885, Edward C. Pickering at the Harvard College Observatory undertook an ambitious program of stellar spectral classification using spectra recorded on photographic plates. By 1890, a catalog of over 10,000 stars had been prepared that grouped them into thirteen spectral types. Following Pickering's vision, Annie Jump Cannon expanded the catalog to nine volumes and over a quarter of a million stars by 1924 and developed a system of ten spectral types - O, B, A, F, G, K, M, R, N, S - that astronomers accepted for world-wide use in 1922. During the latter half of the nineteenth century, photography became an accepted tool for recording the images and information produced by telescopes and spectrographs. This process was neither inevitable nor easy. Advocates of astro-photography worked hard to convince a sometimes skeptical science community. In 1840, the British-American chemist J.W. Draper took the first successful image of an astronomical object, the Earth's moon. This was a daguerreotype — an early photographic process in which the image was produced on a silver plate sensitized to iodine and developed in mercury vapor. The 1840s witnessed a series of "firsts" for astro-photography: besides the first picture of the Moon, the first solar eclipse (1842), the first solar spectrum (1843), and the first pictures of the Sun (1845). Like Draper's pioneering image, these were made using the daguerreotype process. A new technique appeared in 1851 when F. Scott Archer introduced the wet collodion process. A glass plate was coated with a solution of collodion (a mixture of guncotton and potassium iodide in alcohol and ether). Coating the plate with the solution was a learned skill. Plates were exposed while still wet, hence the name. Once dry, they were dipped into a solution of silver nitrate which converted the iodide to silver iodide. While cumbersome and tricky, the result was a process much more sensitive than a daguerrotype, able to record light from stars and other celestial objects. At this time, dedicated amateur astronomers made valuable contributions to the development and acceptance of astro-photography as a research tool. The first American telescope designed specifically for astro-photography was built by Lewis M. Rutherfurd, an amateur astronomer. This 11-inch refractor was located in the garden of his New York City home (near what today is 2nd Avenue and 11th Street) in 1856. Soon after this, Henry Draper, another amateur scientist in New York, began a campaign to optimize the photographic telescope and combine it with stellar spectroscopy. In 1872, he took a photograph of the star -Lyrae (also called Vega) that was the first to show a star's spectroscopic absorption lines. A decade later, he detected emission lines in the spectrum of the Orion Nebula, recorded in an exposure with his 28-inch reflector that took 137 minutes. In general, large photographic reflectors like Draper's remained the domain of the serious amateur astronomer while the preferred tool of professional astronomers was still the refracting telescope. 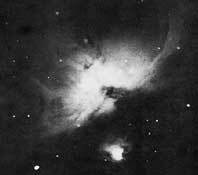 First photograph of the Nebula in Orion, taken by Henry Draper in 1880. 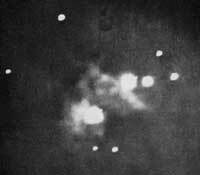 Photograph of the Orion Nebula taken by A.A. Common in 1883 with an exposure of one hour. The Hubble Space Telescope's amazing picture of the Orion Nebula is here. Wet-plate technology also limited the usefulness of photography as a serious research tool. By the 1880s, these barriers had dropped and astro-photography began to play more than a peripheral role in astronomy. This was partly spurred by British and French developments of dry plate techniques. For a typical dry plate, a mixture of zinc bromide and nitric acid was added to a standard collodion mixture, followed by an addition of silver nitrate in water and alcohol. This created an emulsion of silver bromide which could be poured into a dish to let the solvents evaporate. Once dry, the material was dissolved in alcohol and ether and applied to glass plates. The final step was to coat the plate with a preservative. Further refinements to this basic process increased the sensitivity of dry plates so that they could "see" much more than the human eye could. 1860 expedition to observe and attempt to photograph a solar eclipse at Rivabellosa, Spain. The appearance of a new breed of astronomer in the 1880s also speeded the acceptance of astro-photography. Individuals (often trained in physics) who were interested in the emerging discipline of astrophysics adopted photography as an essential tool of their trade. By the end of the nineteenth century, astro-photography had expanded the vision of scientists once again beyond that of the naked eye, and provided a permanent record of the information collected by the telescope and the spectrograph. How did astrophotography help measure the cosmos? Henry Rowland and his ruling engine. Who Was George Ellery Hale? While spectroscopy appeared to be a promising tool for the new science of astrophysics, researchers were limited by their equipment. Early spectrographs, such as those used by Henry Draper, used glass prisms to disperse the light. While simple in principle, prism spectrographs could have a low resolution and it was often difficult to find a prism of sufficient optical quality. An alternative design was to use a diffraction grating to disperse the light collected by the telescope. This is a surface on which very fine and evenly spaced lines are ruled. These grooves use the wave properties of lighteach color a different wavelengthto break light into a spectrum. The craft of producing large high-quality gratings was especially well-developed in the United States. Henry A. Rowland, an American physicist at Johns Hopkins University, was the person most responsible for making the larger and more accurate diffraction gratings that revolutionized spectroscopy in the 1880s. Existing gratings were of poor quality because it was impossible to obtain uniform line spacings. Rowland's solution was an exceptionally accurate screw to move the device that inscribed the lines on the grating. As many as 43,000 lines per inch could be made on a grating that was twice as large as those available previously. Rowland also developed a technique to make spherically concave gratings which were self-focusing. The concave gratings allowed the spectra to be directly focused on a photographic plate, making spectroscopy simpler. A picture of the Sun in the light of the main spectral line of hydrogen (H-alpha) reveals many features in the atmosphere of this ordinary star. Another new device that came into usage about the same time as Rowland's gratings was the spectroheliograph, which gave an image of the entire face of the Sun in a single wavelength of light. 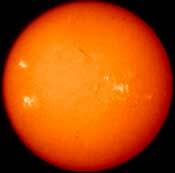 This opened up a whole new area of solar research and enabled researchers to probe features of the sun in more depth. While its invention is generally credited to George Ellery Hale in 1889, earlier versions of the tool had been around since 1870. Hale's new tool allowed researchers to see several new features of the sun. Hale's work, important in its own right, helped establish him as one of the leading scientist-statesmen of the early 20th century. This facilitated his activities promoting and raising funds for new large telescopes and astrophysics in general. He was also able to use his stunning results to eloquently argue that stellar and solar research complemented each other and that research on the nearest star to us would help scientists understand the secrets of all other stars.